In the study of granular materials, determination of stable regimes such as finding the angle of repose or the angle of maximum stability has always been a focal point. However it is important to note that these systems display varied interesting behavior as a consequence of the unusual dynamical response of the system under driven conditions. Previous works have focused on granular jets, sinusoidally driven granular beds or those rotating in silo without initial perturbation. In this work, we study the behavior of a system wherein grains are dropped one by one in a rotating quasi-2D container. Furthermore, this behavior is modelled using a cellular automata simulation. Interestingly, although the granular system is under a constant driving torque and is provided with a constant perturbation through the kinetic energy from the continual addition of grains, the system has formed and maintained stable granular heaps consistent for both experiment and model. C. Janer and R. Batac. 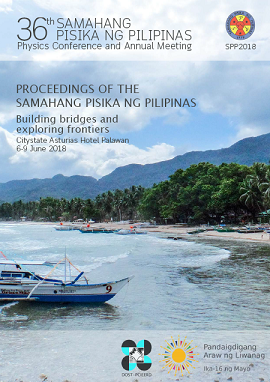 Quasi-static regimes in a continuously-rotated and slowly-grown granular setup, Proceedings of the Samahang Pisika ng Pilipinas 36, SPP-2018-PB-30 (2018). URL: https://paperview.spp-online.org/proceedings/article/view/SPP-2018-PB-30.